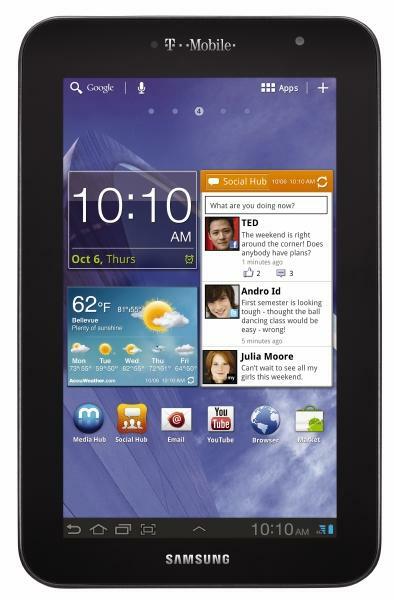 T-Mobile has announced it’s very own 4G version of the Galaxy Tab 7.0 Plus ready to rock your 4G world on November 16th. For just $250 with a two-year contract after a $50 mail-in-rebate there is a special catch here as the pricing includes “20 interest free monthly payments of $10″ on top of T-Mobile’s base data plan pricing of $29.99. T-Mobile customers who are currently on a post-paid monthly subscription will receive $10 off their monthly mobile broadband service as well. The specs on the Galaxy Tab 7.0 are no slouch thanks to a 1.2GHz dual-core Exynos 4210 processor, 7” LCD with 1024×600, 3 megapixel rear-facing camera with 720p video recording, 2 megapixel front-facing camera and 16GB of internal memory (expandable to 32GB). The Galaxy Tab 7.0 will launch with Android 3.2 and there is no word if the Galaxy Tab 7.0 will be upgraded to Ice Cream Sandwich down the line. 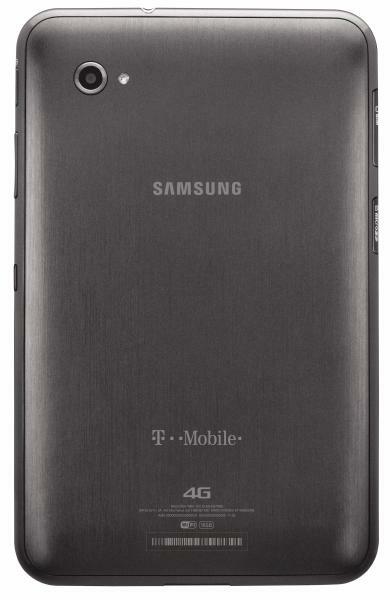 BELLEVUE, Wash. — Nov. 8, 2011 — T-Mobile USA, Inc. today unveiled the ultra-mobile Samsung Galaxy Tab™ 7.0 Plus, the latest to join the company’s portfolio of 7-, 9- and 10-inch 4G-enabled* tablets. Featuring a brilliant 7-inch multitouch display and weighing just 0.77 lbs., less than a can of soda, the Samsung Galaxy Tab 7.0 Plus is one of the thinnest and lightest 7-inch tablets on the market, making it easy to watch popular TV shows and movies, download full-color magazines, compete in multi-player gaming and more – all while on the go. Equipped with a 3-megapixel rear-facing camera with flash for photo, and Mobile HD video capture and playback in 720p** as well as a 2-megapixel front-facing camera which can be used to connect with friends and family via Video Chat, the Samsung Galaxy Tab 7.0 Plus makes it possible to connect and share life’s most important moments while on the go. The Samsung Galaxy Tab 7.0 Plus will join the recently announced T-Mobile®SpringBoard™ with Google™ and Samsung Galaxy Tab™ 10.1, as well as the T-Mobile G-Slate™ with Google, to offer an affordable and compelling portfolio of 7-, 9- and 10-inch 4G tablets with down payments ranging from $179.99 to $399.99***. ← Want More TmoNews? Add TmoNews On Google+! So the tablet gets Exynos, while their phone doesn’t on tmobile. Interesting tablet nonetheless, and glad to see WildTangent on it. ^ Then why does the tablet say 4G and has the Exynos? That pricing structure seems confusing. 20 months with $10/mo extra? So, that really brings the price of the unit to $450 (excl data). Google finally releases the ‘real’ tablet OS, and not only does this not ship with the latest OS, but there’s no saying it will ever see it. Great way to move units. I have been an Samsung’s model user for all my life and they never failed me. Loved the design, this is a great device! I love t-mobile’s value plans. BYOD, sign a contract, and they will subsidize your plan vice the device and save you about $15 a month off the classic plan price. Cool idea, however, allowing you buy a device with down payment and monthly installments does nothing but make it just like the classic plans and confuse the heck out of everyone. If you want a subsidized phone, get a classic plan. If you want to buy the device outright and save money each month on service, get a value plan. According to the actual tmobile site the Plus is “coming soon” with a Windows 7 OS …but it also lists a 10.1 display so its pretty messed up at the moment and obviously not accurate…. .